One thing we often hear on forums when it comes to Japanese boxing is that the shows, at least at title level, often double up on titles and to be fair we do tend to get title double headers. 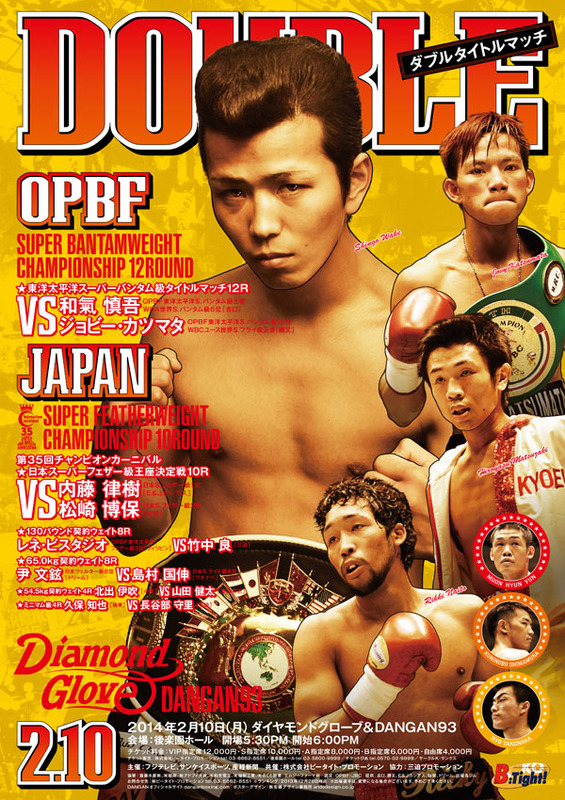 The first of 2014 comes on February 10th at "Dangan 93" a show that features both an OPBF title fight and a Japanese national title fight. The headline bout is the OPBF Super Bantamweight contest between the wonderful talented Shingo Wake and Japanese based Filipino Jovylito Aligarbes/Jovylito Katsumata. Wake, defending his belt for the 3rd time inside a year, will be the clear favourite though Jovylito has won his last 3 bouts in Japan following a stoppage loss to Nobuhiro Hisano last April. In the chief support bout the unbeaten Rikki Naito will be facing the much more experienced Hiroyasu Matsuzaki in a battle for the vacant Japanese Super Featherweight title. The belt, which was vacated by Daiki Kaneko, prior to Kaneko's world title fight with Takashi Uchiyama, is the 3rd Japanese title fight of the year and looks set to be a genuinely excellent one. As a poster we like this one. It has the 4 main fighters clearly visible as well as 3 of the undercard fighters, in small inset pictures, it tells us what the show involved and it has a very much "classic" look to it. Excellent over-all work by the Dangan team for this one.